Kyle Bryan Boller (born June 17, 1981 in Burbank, California) is an American football Quarterback for the Oakland Raiders of the National Football League. Boller was drafted out of the University of California by the Baltimore Ravens with the 19th pick in the first round of the 2003 NFL Draft. He also played for the St. Louis Rams in 2009. Boller has been considered a professional bust, as his success with any of his NFL teams was very limited, unlike his college football career. 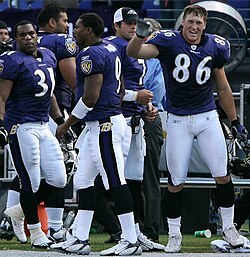 Boller (7) with the Baltimore Ravens in 2006. Boller is married to former Miss California, Carrie Prejean. This page was last changed on 23 June 2017, at 00:43.